The cannon is a IX Dahlgren Shell Gun Cannon, one of 48 made by six manufacturers. Of the Cannons made by the S. Mc. M & C Company, only two are know to survive. The Zorn Park cannon and the other one is at Great Lakes, Illinois. 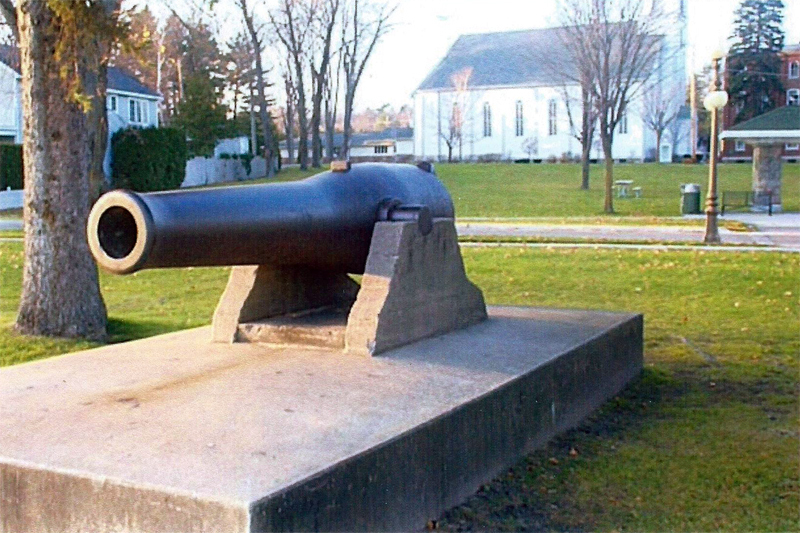 The Zorn Park cannon is a standard cast iron nine inch shell gun that was purchased by the US Navy during the Civil War. The Navy used Roman numerals to mark the bore size. In this case the diameter of the bore is nine inches ie it fired a nine inch diameter iron exploding projectile. The 1862 is the year it was manufactured. The P is a Navy marking meaning it was test fired prior to shipment to the Navy. The R.B.H. marking is the initials of the government inspector Robert Bradley Hitchcock. This effectively told the Navy that its cannon was manufactured and tested properly. The 9061 lbs is simply the finished weight. Company of Reading, Pennsylvania operated an iron foundry known as The Scott Foundry. The N° 610 is the registry number. This is now caiild a serial number. An anchor could possibly be engraved on the top middle of the cannon - probably about 2" long. Another small number 34 may be found on the face of the right trunion rimbase. This is the foundry number. The manufacturer used this to track the cannon through the manufacturing process. The inventor of this type of cannon was Admiral John A Dahlgren (1809-1870). Typically these cannons were called nine inch Dahlgrenfs. The official Navy designation was a IX shell gun. The period of 1870-1920 was a very patriotic time in U.S. History. Veterans collected in small groups. Army veterans formed GAR posts ie Grand Army of the Republic Posts. This was the forerunner of the American Legion. Navy veterans had a similar but less visible organization. Harbor Springs had GAR Post 13. By 1890 the government had thousands of obsolete cannons stored around the country. Several Acts of Congress were passed that allowed these to be donated to veterans organizations and cities for monuments. Application was made through local congressmen. While the type of cannon could be specified, actual deliveries were more potluck as to the type. In all cases the receiving party was responsible for freight and unloading. Shipment was by rail car. Cannons weighed from 800 lbs to 20,000 lbs. The exact numbqr of cannons donated is not known. Our computerized listing of known surviving Civil War cannons is now at nearly 5,200. We also know that thousands were given to World War II scrap drives. The first was a a 4.2" Army Parrott cannon shipped to CAR Post 13 in 1897. It is not known to survive. The second was the IX Dahlgren (S.24.614. No 610). It was shipped to the Harbor Springs village president in 1909. By 1909 this was on the tail end of the large scale donations. Surviving IX Dahlgren shell guns number 48 and were produced by six manufacturers. Only two produced by S.M.' M. &	are known to survive. The one at Harbor Springs and another at Great Lakes, Illinois. I do not know how many they produced. This will take several hours of research to determine. I will try to determine in the next several weeks which ship No 610 served on. With the early 1862 date it is almost certain it saw active duty. The delivery of No 610 to Harbor Springs in 1909 would have been a big event. The unloading of a 9,000 lb cannon by a group of 60-70 year old veterans plus the erection in Zorn Park would certainly have been a local news item of considerable importance. A check of old papers around May 30, 1909 or 1910 might have more information. The current May 30± Memorial Day was then called Decoration Day. Always celebrated on May 30 it was a more important event than July 4. 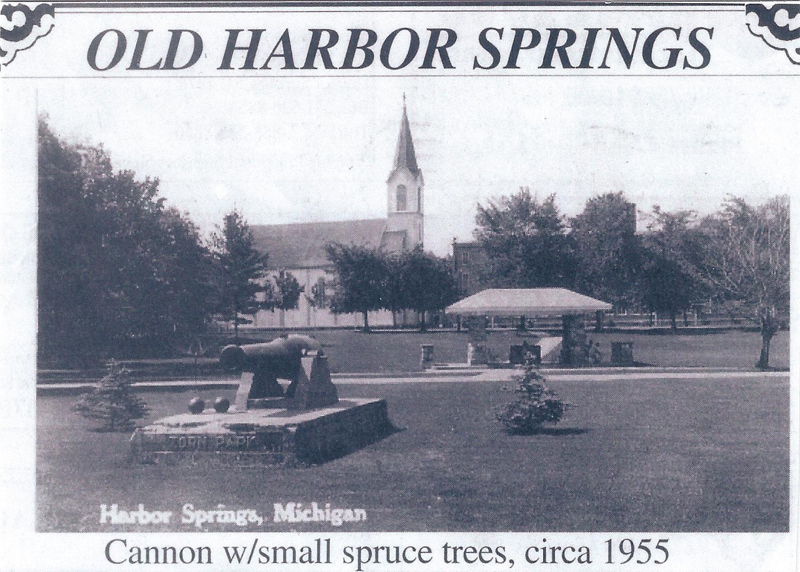 While the Harbor Springs Navy cannon is known to survive the Army cannon donated in 1897 has not been found. Navy veterans liked to have their cannon near water and highly visible. Army veterans preferred to have their monuments in remote wooded cemeteries ­always on the highest point. A check of local remote cemeteries might turn up the 1897 donation. Michigan has eight, or almost 20% of known IX inch Dahlgren survivors. The monetary value of such cannon the collectors market is often an issue. The value on the collector's market is currently $10,000-$15,000 for this type of cannon. If you ever have reason to take a photograph of the Zorn Park cannon I would appreciate a print for my file.